Scientists at the National Science Foundation announced Wednesday morning they have captured the very first image of a black hole. Using a global network of telescopes over the course of more than a decade, scientists were able to locate and photograph the supermassive black hole at the center of a galaxy known as M87. While we have known for some time black holes exist, direct visual evidence of one has been elusive. Black holes are some of the most mysterious objects in the universe, due to the extreme gravitational pull they exhibit, making it impossible for even light to escape its pull. The point where all matter and light crosses the point of no return is known as the event horizon, which is what you see in this photo. 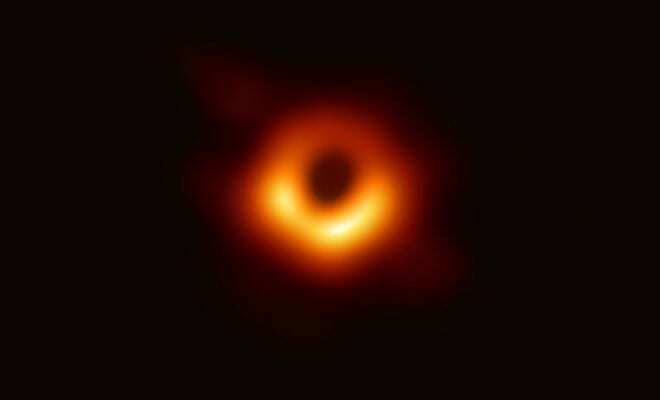 The dark circular part of the photo is the area where no light can escape from the pull of the black hole, while the reddish area is superheated matter and gas being sucked in by extreme gravitational forces. The galaxy in which it was found is 55-million years from Earth near the Virgo galaxy cluster. This particular supermassive black hole is estimated to have a mass that is 6.5 billion times that of our sun. The network of telescopes to make this incredible discovery are known as the Event Horizon Telescope Collaboration, and more than 200 researchers were involved in pulling off this project. The project is aptly named for its goal of photographing the part of a black hole where light is about to cross the point of no return. By using the combined power of eight telescopes across the world, scientists were able to create a virtual telescope around the same size as the Earth itself. The process involved a highly coordinated sequence of positioning from observatories originating in different locations around the globe. Scientists are still working on imaging Sagittarius A*, the supermassive black hole at the center of our own galaxy, though they say it’s a harder image to source when compared to the one located in M87. With this discovery, we are making significant progress in understanding one of the most strange complexities in the entire universe. Black holes “have exotic properties and are mysterious to us, yet with more observations like this one they are yielding their secrets,” said National Science Foundation director France Cordova.